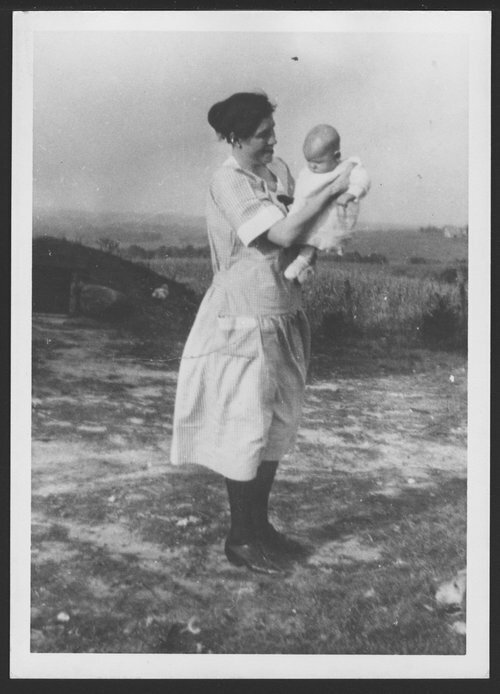 A photograph showing Susie Spainhower Lykins holding her son Robert Dawson Lykins. She and her husband Lloyd Lykins moved from Denver, Missouri to Atchison, Kansas in 1935. Their children Robert Dawson, Frances, and Jess Barton were born in Denver, Missouri, but they spent most of their childhood in Atchison, Kansas. Robert Lykins owned a grocery store and later sold automobiles for Phalen Motors in Atchison. Also, he served as Atchison County Commissioner from 1962 to 1978.